The finds, dated to around the 7th century A.D., predate the origins of similar sophisticated painting techniques in medieval Europe and the Mediterranean by more than a hundred years. The discovery may also provide insights into cultural exchange along the Silk Road connecting east and west Asia during that time period. . . . Using gas chromatography and mass spectrometry, scientists found that samples from 12 caves and the two destroyed giant Buddhas contained oil- and resin-based paints—likely the earliest known use of either substance for painting. Yoko Taniguchi of the Japan Center for International Cooperation in Conservation in Tokyo presented the findings at a recent international symposium held there. 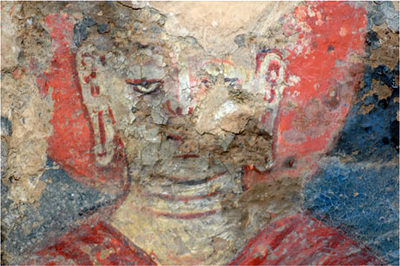 The analysis showed the murals were painted using a structured, multilayered technique reminiscent of early European methods. Cool! Now I am going to go to Afghanistan for sure. Who knew Picasso was around back then?